Friday, 9 August 2014; One Year, One Hundred and Thirty Days Old. Hubby improvised a bath for Ayla this evening and it worked a treat! This house has no bath ( yet, just wait ’til the renos are finished!) so since outgrowing her baby bath Ayla has had to have showers. Occasionally I’ve blocked the shower drain with a face washer or my foot to try and give Ayla some water to splash in, but this evening Hubby used a nonslip bath mat and voila! Instant bath. Ayla sat in the “bath” for ages. 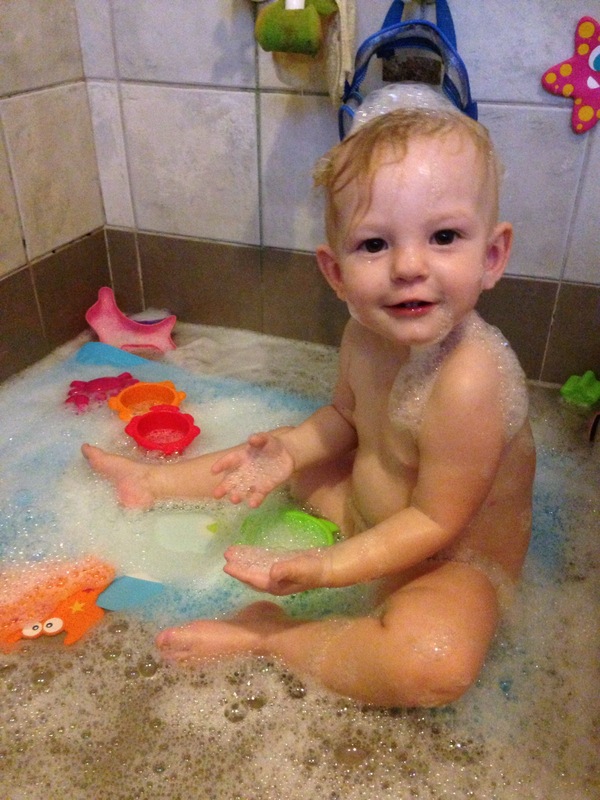 I put bubbles in and gave her some extra toys and Ayla played and splashed for well over half an hour. Ayla also learned that bath bubbles make noise, so she started rubbing them into her ears and then giggling at the sound of the popping and crackling. It was cute, fun and a definite redo; Ayla loved it and mummy and daddy get some time to sit and chat and watch our beautiful little munchkin learn and play.